Slabs made of high-density, low-porosity ceramic porcelain. 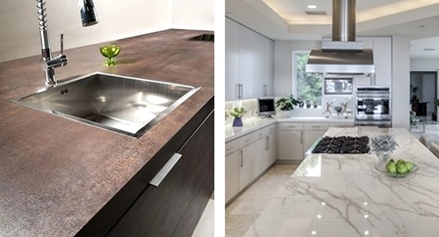 Porcelain benchtops (also known as ultra compact or sintered compact surface sheet material) are made of high-density, low-porosity ceramic porcelain slabs. 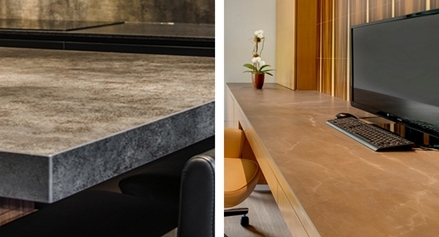 These Large Format Porcelain Sheets for benchtops are made of powdered clay and pigments which are bonded together and pressed under high pressure and extremely high temperature. The fine particles used enable the surface to be formed into different finishes, from smooth, to gloss, to realistic textures. Some manufacturers also add glass and quartz into their powdered clay. Designs are also printed onto the surface so to mimic a range of materials including Slate, Wood, Concrete, Marble and Limestone but these printed designs are just skin deep. 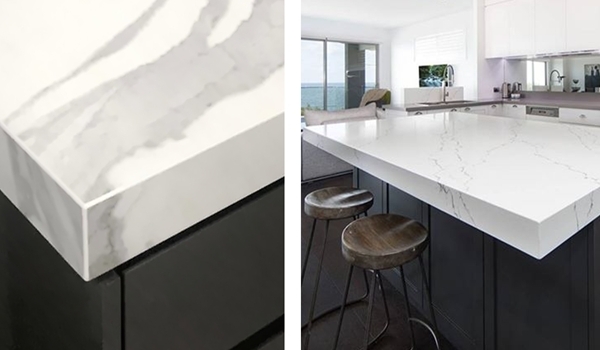 Large format sheet Porcelain for benchtops and splashbacks is made by brands such as Neolith, Maximum, Dekton and QuantumSix+, where each have their own unique range of patterns, finishes and styles. 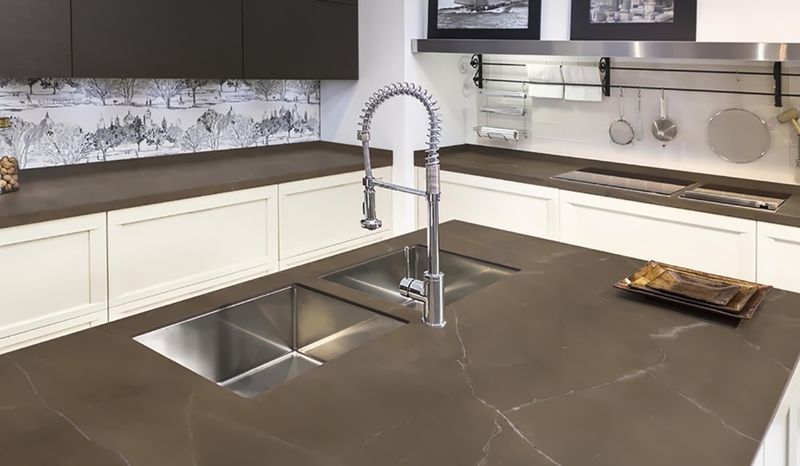 This Porcelain benchtop material with its high density and low porosity make it ideal for the use in Kitchens, Laundries and Bathrooms. The material is highly resistant to foods and liquids absorbing into the surface, where in other low density materials stains and bacteria can develop such as red wine rings on Marble, making this material a great alternative. Porcelain’s hardness also makes it excellent around cutting surfaces as it has exceptional scratching and abrasion resistance. This Porcelain sheet is also heat and fire resistant, which makes this an excellent benchtop and splashback surface for around gas cooktops. 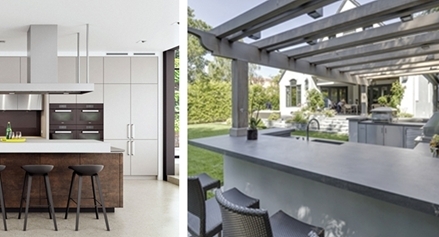 Likewise Porcelain sheet is also UV resistant thus they will not fade in direct sunlight, making porcelain benchtops a great decorative material for outdoor Kitchens. 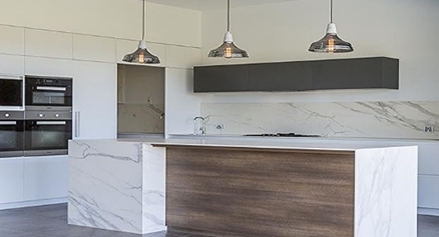 At the moment Porcelain slabs are manufactured at 3.2 mts x 1.6 mts and 3.6 mts x 1.2 mts, making these sheets larger than the standard 3 mts long that Reconstituted Stone slabs are produced, where this extra length may be helpful in avoiding seams or joins in those long Bench tops and Splashbacks. 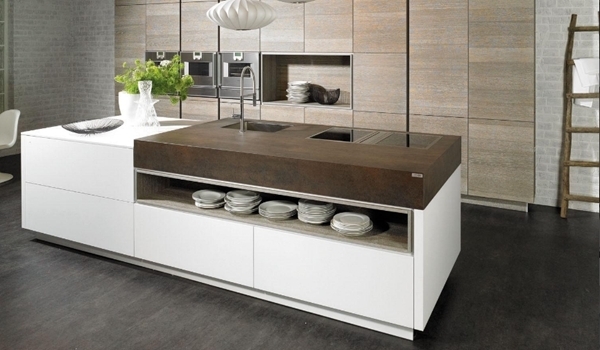 Some of these manufacturers are producing a range a thicknesses, down to just 3 mm, which also enables this material to be used as facings on Doors, Drawers, other cabinet panels, for feature walls as well as for Splashbacks. As for drawbacks, apart from this being a very heavy material to work with; those designes that have patterns on porcelain are just skin deep; being a printed pattern surface, where when these are cut or have a groove routed into them, the unprinted porcelain underneath is revealed. This is not a problem with all the porcelain designs though as some just have a solid colour surface; for example those such as Nero, Basalt Black, Zimbabwe River and Arctic White by Neolith to name just a few are like this and these are also made with a colour matching clay core where these together minimize any colour differences to cut edges or routed grooves, matching in well when these are honed & or polished.